Introducing two new glazes. 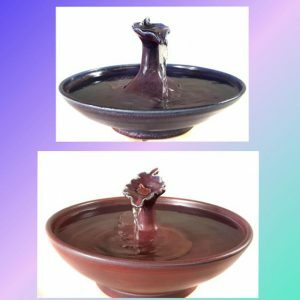 The cat fountain on top shows a beautiful, rich purple speckled with silver and has magenta under tones and which we are currently calling Almandine. The second we are calling Plum which is magenta with lavender undertones. We make our glazes from raw minerals which gives us the ability to experiment and come up with new glazes as well as new glaze combinations. They don’t all succeed but those which do, and we feel these two do succeed at giving lovely coloration for our cat drinking fountains, become a part of our repertoire. Those that don’t we chalk up to experimentation and move on.